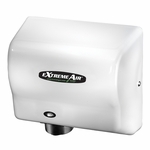 This Classic series soap dispenser has a corrosion-resistant valve, which dispenses thin, free-flowing commercially marketed all-purpose hand soaps. It consists of a chrome-plated ABS mounting bracket. Translucent polyethylene container provides visible soap level. Capacity: 24-fl oz (0.7-L).